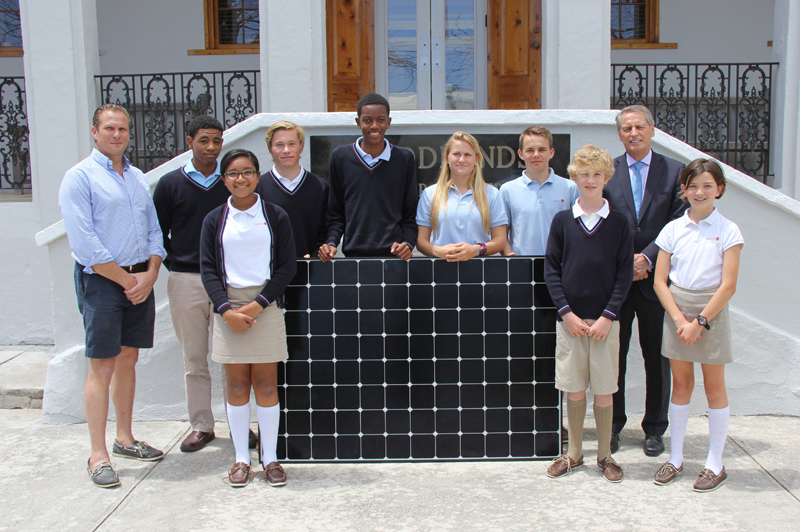 Energy costs at Saltus Grammar School are set to plummet as it embarks on a project to harness the power of the sun and become even more environmentally conscious. This summer the school will install 212 SunPower panels which will produce approximately 100,000kWhs per year and supply energy to the main building. According to Tim Madeiros, whose company AES Solar is installing the solar panels, permission is also in place to install another 66 panels if required. “The plan is to monitor the energy production versus consumption and make a decision at a later stage whether to proceed with phase two,” he said. “All commercial spaces with large roof areas that have installed solar have seen tremendous savings in operating costs. By controlling the costs to operate a business and taking the risk out of rising energy costs a business is able to control unpredictable expenses and offer savings to clients,” added Mr Madeiros. Deputy Head Jon Beard, said the school needed to find a solution to its rising energy costs. “Solar seemed to be a good option and so we researched the availability on the Island. “The main providers all have excellent products and give great service. Making a decision on who to use was therefore one of product and financial arrangements that best benefited the school. “We are hopeful that as we develop such energy-saving features it will be a way of helping to keep costs better managed. If the cost of electricity is $0.45/kWh, it is expected that once the cost is paid off, the annual savings will be around $45,000, the school said. Work will start once the building permit is issued and it is hoped the project will be completed by the end of July. Looking good Saltus. Leading the way on smart choices for the school and the island. very proud of my school! OPEN your eyes BELCO….get on the bandwagon or get off the pot. One way or another, we are going to force renewable energy on you. If you don’t create it and at a lower cost for consumers, WE WILL!